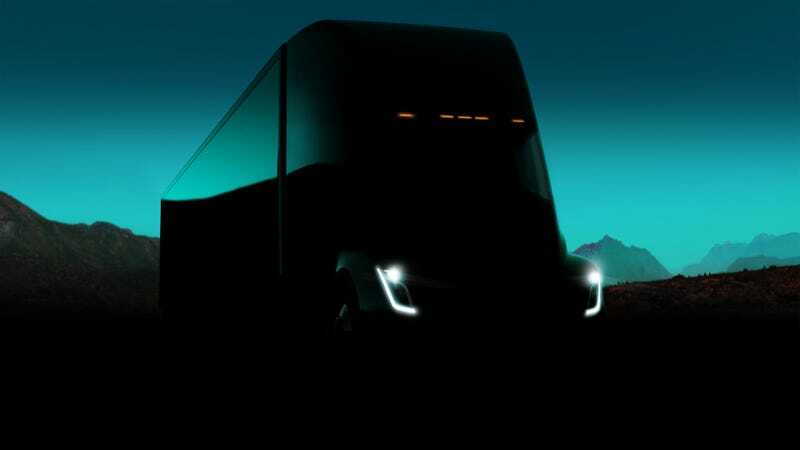 The semi truck is the latest addition to Musk’s vision of an all-electric world, where cars, trucks, and homes are all powered by clean energy. What’s up with this electric truck? Well, it’s a semi truck... but with a battery instead of diesel tank. It’s automatic, and it has no gasoline engine or transmission, so it should theoretically require less maintenance than a normal truck. “I can drive this thing and I have no idea how to drive a semi,” said Musk. It’s also built on the bones of the Model 3—there are two Model 3 engines driving each of the rear axles, Model 3-style press-in handles on the doors, and two Model 3 screens in the cab—so there’s a lot of continuity between Tesla’s cars and its new truck. “We designed the Tesla truck to be more like a bullet,” Musk said, comparing the vehicle to typical semi trucks. The Tesla semi truck has a 500 mile range and can go from 0-60 MPH in 5 seconds (in 20 seconds while carrying 80,000 pounds). Musk did not reveal a price for the truck on stage, but claimed it would wind up costing 20 percent less per mile than a diesel truck. Production of the truck will begin in the year 2019. “If you order now, you get your truck in 2 years,” Musk said. How luxe is the cab of the truck? In keeping with Tesla’s attention to design, the interior of the truck is faaancy. The cab has full standing room and the driver’s seat is positioned in the center (rather than off to the left), which is intended to provide better visibility. The seat is flanked on either side by touch screens that provide blind spot monitoring and navigation. “But if you’re going to make a product, make it beautiful. Even if it doesn’t affect sales, I want it to be beautiful,” he added. But the interior layout isn’t just about driver comfort—the truck also comes with tracking features to be used by a fleet manager for routing, monitoring, and scheduling. Is there any of Tesla’s self-driving tech in it? Yup. The truck isn’t fully autonomous, but it does have Tesla’s Enhanced Autopilot system, which includes automatic emergency braking, lane detection, and lane departure warnings. The truck has a few other automated safety features, too. Exterior cameras help cut down on blind spots and aid with object detection. It also comes equipped with sensors that can detect instability and adjust each wheel individually to prevent jackknifing. “Jackknifing is impossible. The worst nightmare is gone—gone—with this truck,” said Musk. On stage, Musk boasted about the truck’s reliability and durability. He guaranteed the semi truck will not break down for a million miles. “The truck will actually anticipate when it needs maintenance and inform you ahead of time,” said Musk, after touting the durability of the “armor glass” windshield. Is the Supercharger network going to expand? Musk boasts that its semi has 400 miles of range after 30 min of charging. “By the time you are done with your break, the truck is ready to go. You will not be waiting for your truck to charge,” he said. But one of the big questions hanging over this launch is how an entire fleet of electric trucks would charge. Tesla currently has over 2,000 Supercharger stations, which can power up a Model S in less than an hour. But it’s not clear if that network could support the addition of thousands of trucks. The company is currently working to expand its Supercharger network, so hopefully there will be enough stations to accommodate the trucks by the time they start showing up on the road.